Bugaboo Glacier Provincial Park is located in southeastern British Columbia, west of Highway 95, between Golden and Radium Hot Springs. The park is situated in the Purcell Mountains which are over 1500 million years old. Much of the weak, overlying rock has been removed by the erosive forces of water and glacial ice to reveal the solid granite spires for which the park is known. With many peaks over 3,000 metres in elevation the Bugaboo’s offer awe inspiring mountain and glacier terrain. The area has been popular with mountaineers since the days of the Palliser Expedition of 1857 to 1860, and continues to draw climbers from around the world. The firm rock, significant altitude and fierce weather conditions make for world-class challenges for experienced climbers and mountaineers. The early routes of pitons and bolts have been replaced with less damaging aluminum chocks for protection. The Purcells were named for Goodwin Purcell, the expedition sponsor. Although road access is reasonably easy, the few trails within the park are dangerous and demanding. Inexperienced and/or ill-equipped hikers and climbers should make arrangements to visit a more suitable area. Access - The access road begins begins at Brisco (27 kms north of Radium Hot Springs or 76 km south of Golden on Highway 95). The entrance to Bugaboo Glacier Provincial Park is 45 km west of Brisco. From Hwy #95, this 50 km gravel road is open late spring through late fall. A 4x4 is not required but a 2wd with some decent ground clearance is recommended. The last 3km section of the gravel road is rough; low-riding compact vehicles need to go slow to avoid scraping the bottom. It is recommended that visitors protect their vehicle perimeter with a portable chicken wire fence to deter porcupines and other small animals from chewing on rubber brake lines and tires. Camping - There are tent pads available below the Canrad Kain Hut, an overnight accommodation available for up to 35 people. Propane stoves and sleeping pads are provided. Hiking & Trails - The Bugaboos, a favourite with mountain climbers and heli skiers is also an excellent place to hike. 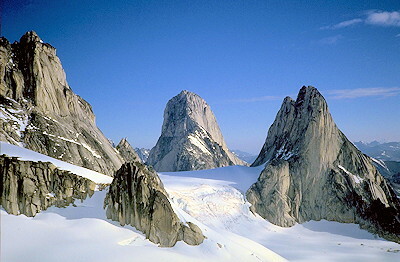 Extensive trails of varying length and difficulty provide access to the most notable features of Bugaboo Glacier Provincial Park.